The New York Times took a beating two months ago for whiffing on the defenestration of 10-term incumbent (and potential future House Speaker) Rep. Joe Crowley by Alexandria Ocasio-Cortez in New York’s 14th Congressional district. 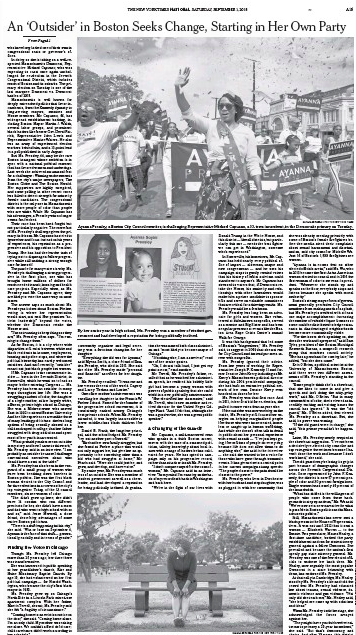 Apparently, the Grey Lady has resolved not to repeat the error in similar quixotic races, as yesterday’s front-page profile of Massachusetts 7th Congressional district hopeful Ayanna Pressley by Katharine Q. Seelye and Astead W. Herndon indicated. CAMBRIDGE, Mass. — It’s not a sight you see every day, certainly not around Boston — a black woman mounting a plausible challenge to a 10-term white congressman from her own party, a politician with vast connections who votes the progressive line and opposes everything Trump. But here was Ayanna Pressley, a Boston City Council member and rising Democratic star, exhorting volunteers in a Cambridge restaurant with an impassioned performance style she learned as a child at her grandfather’s storefront Baptist church in Chicago. As did the Times, some might say, considering that the paper gave Pressley a full-page jump. Even better, Pressley got a Big Town bonus, hitting the NYC Dailies Double with this piece by Jennifer Levitz and Reid J. Epstein in yesterday’s Wall Street Journal. BOSTON–Only one Democratic incumbent has lost a congressional primary this year, and Massachusetts Rep. Michael Capuano is trying to avoid becoming the second. Mr. Capuano, a down-the-line liberal who refused to attend President Trump’s inauguration, faces a stiff challenge from Ayanna Pressley, a Boston city councilor. Unlike other Democrats who have challenged incumbents from the left, Ms. Pressley has few policy differences with Mr. Capuano. Instead Ms. Pressley, who is African-American, is making the argument that Mr. Capuano, a white 10-term incumbent who was the mayor of Somerville before going to Congress, isn’t enough of an activist on progressive issues for an urban district where racial minorities make up roughly 58% of residents. The two face off in a primary on Tuesday. We’ll see then how the New York papers play the result. This entry was posted in Uncategorized and tagged Alexandria Ocasio-Cortez, Astead W. Herndon, Ayanna Pressley, Jennifer Levitz, Joe Crowley, Katharine Q. Seelye, Mike Capuano, New York Times, NYC Dailies Double, Reid J. Epstein, Wall Street Journal. Bookmark the permalink.